How do you react when a client gives you just five weeks to reinvent their brand? You shift into high gear and get it done. 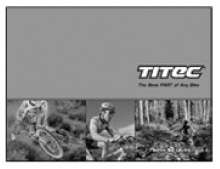 Titec, a leading high performance bicycle parts manufacturer, is known as The Porsche of Mountain Biking. So perhaps it should come as no surprise that acceleration is not only a part of their brand… but also of their timing. They hired Avantgarde just five weeks before a critical launch, tasking us to give their brand identity a new look while increasing after-market sales to a new target audience. Just 35 days and a limited budget to develop, design and print the 2002 advertising campaign, catalog, and business cards. First things first – we needed to define this new look to make sure everyone was on board. Through industry research we created a structure for the metamorphosis of Titec in the new season. Once the client approved this direction, Avantgarde hit the ground running. From developing a four-ad campaign to a new product catalog, which included design, photography, production layout and copywriting as well as printing, we were able to give Titec a complete overhaul in record time. Avantgarde delivered all ads to Titec’s contracted media in time to launch its new campaign at EuroBike in Germany, the season’s opening event. The perfect compliment to the new ad campaign was the sleek, Porsche-like metallic catalog introducing new products and giving a fresh look to the existing line.